Posted on October 15, 2014 at 9:13 am. A NEW casino platform, which eliminates the house, is set to be unveiled at EiG Berlin this month. Bet Trade, which are the inventors of “No House”, believe that by removing the house edge, their platform will provide more control, greater social interactions and provide players with a greater sense of security. The casino, as well as having no house, will have 100 per cent pay-out, meaning that all money put in by players will be paid out. Founder George Georgeiopoulos said the “house always wins” rule when gambling was dead in the water with their new platform. “We wanted to make casinos more social by adding more than leaderboards and achievement medals,” Founder George Georgiopoulos said. “Players now play directly against others, a real person, a real player wins every game. While it is still in its early stages, two years of research and development has gone into No House, with it aiming to be the Betfair of the online casino industry – handing power back to the people. The concept has raised significant seed funding and is expected to attract plenty of interest at EiG Berlin, with the company to role out a free version of the platform via social media in the coming months. How does Bet Trade work? Bet Trade pays out 100 per cent of all money put in. Players bet in exactly the same way in roulette, slots, blackjack and more. The bets are then matched and winners given the funds collected from the bets placed. For example, Bet Trade will take the zero off the roulette wheel which eliminates the house edge. A bet on red would then be matched with an identical bet on black – giving the two players exactly a 50 per cent chance of winning. 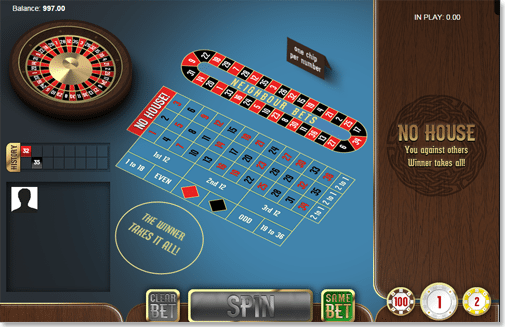 This model of casino allows the player to cash out, double down or adjust their bet before the winner is announced, which is how the casino makes money. Bet Trade says that enough players are using these options in their prototype to generate the same or more revenue than a traditional casino. CasinosOnline.com.au’s parent company, 8th Rule Media, is an official media partner of EiG (Excellence in iGaming) Berlin. The event runs from October 21-23 in the German capital and allows people in the iGaming industry the opportunity to network, keep up with the latest trends and generally stay on top of this evolving game. The speakers at EiG Berlin include revered computer game and video game designer Don Daglow and the Portman Group’s Chris Searle, who are not directly involved in online gambling, but are set to provide a different perspective on iGaming. Sign up at Royal Vegas Online Casino and get up to $1200 in free bets.